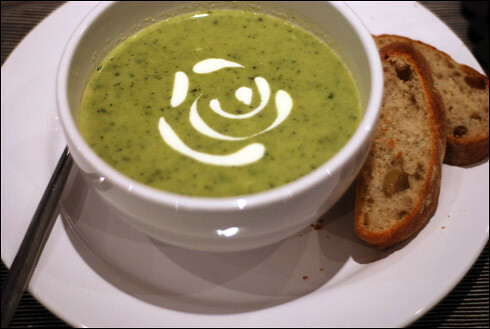 A continuation on the healthy eating, rather soup-y trend - here is yet another soup! The basic recipe comes from a healthy eating cookbook of my mother's (one of the few recipes that actually appealed to me) and is really rather delicious. The roasted courgettes and garlic have a delicate sweetness, and it is also deceptively low in calories - 103 per serving for those watching what they eat. For those being a little less strict about their diets, it is delicious served with a cold glass of white wine and a few slices of fresh ciabatta. Preheat the oven to 200°C, then thickly slice the courgettes into chunks and place in a roasting tray. Add the garlic cloves (keep the skin on) then peel and cut a red onion into wedges and add it to the tray. Drizzle with the olive oil and season with a little salt and pepper. When the oven is up to temperature, roast for about 35 minutes, until the courgettes are golden and tender. While the vegetables are roasting, in a large heavy-bottomed pan bring the stock to the boil then add the petit pois (try to use fresh or frozen and not tinned as the flavour is so much better) and boil for a couple more minutes. Add the courgettes and onions, and peel and add the roasted garlic cloves, then blend until smooth. Stir in the crème fraîche (use half-fat if you want to keep the calories down) and then gently reheat the soup, taking care not to let it boil. Serve with warm ciabatta or other fresh bread and a glass of wine. Enjoy!